Joe McKnight was a multipurpose athlete who was a star in his native state of Louisiana. Recruited by LSU, but later signed with USC, McKnight was an incredibly hyped machine. (He was even touted as a Heisman candidate as early as 2009, but he and USC would not live up to those expectations.) As questions arose about McKnight possibly taking dollars under the table, he declared for the NFL draft in 2010. He finished his Junior season with 1,014 yards, and a robust 6.2 yards per carry. Due to his 6’0″, 198 frame, teams questioned his ability to run in between the tackles and nab extra yards after contact -however they praised his second level deceptive speed and his overall athletic potential. 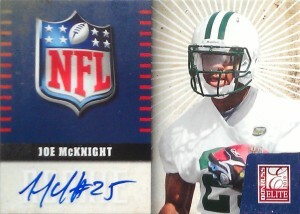 During the 2010 draft, the Jets traded up with Carolina to nab McKnight with a 4th round pick. The Panthers in return, received both the Jets pick in the 4th and 6th rounds respectively. During his time in the pros Joe hasn’t made much in roads as a change of pace back, but has been consistent as a return man, finishing with nearly identical statistics in 2011 and 2012. His first kick off return for a touchdown was a team record 107 yards against the Baltimore Ravens in 2011, and then later in 2012 a 100 yarder against the Houston Texans. The NFL has a limited shelf life for return men, and after the Jets bulked up at RB depth and concussion and migrane issues sidelined Joe during the preseason, McKnight was the headliner of the Jets cuts in 2013. In January of 2014 the Chiefs signed McKnight to a futures contract where he hoped to jump start his career. Starting for the injured Jamaal Charles in Week 3, McKnight piled up 6 receptions for 64 yards, 2 TDs, and 1 carry for 3 yards, but ruptured an Achilles tendon, ending his 2014 season after just that one impressive contest. He played in the CFL in 2016 for both the Edmonton Eskimos and Saskatchewan Roughriders, rushing for 150 yards on 17 carries in his only start. UPDATE – On Thursday, December 1st 2016, Joe McKnight was murdered. He was shot to death by another driver suffering from road rage. Based on news reports McKnight was not the aggressor, and he died on the scene, at the incident.